BIRMINGHAM, ALA (ANS) — According to Bardin and Marsee Publishing, its NIV Waterproof Bible New Testament with Psalms and Proverbs has topped the list of the Top 25 Recommended Resources published by Military Ministry, a division of Campus Crusade for Christ International. In a news release obtained by the ASSIST News Service, soldiers and chaplains have used the Waterproof Bible since 2006, and this recommendation will markedly expand its use. “Thank you for producing such a Bible that I’m sure will withstand the harsh Afghanistan climate,” said an Army chaplain speaking in a news release shortly before deploying with his soldiers earlier this year. The news release said Bardin and Marsee has recently partnered with the Norwegian Bible Society to produce a military Chaplain’s waterproof devotional titled PÅ PATRULJE SOLDATENS ANDAKTSBOK. Bardin and Marsee are also working with the Bible Society New Zealand to publish a custom NLT New Testament with Psalms and Proverbs exclusively for the New Zealand Defense Force. “We are very excited to be working with the New Zealand Defence Force to produce a waterproof New Testament for Army, Navy and Air Force personnel,” said Stephen Opie, Program Director for Bible Society New Zealand, speaking in the news release. At first appearance, the Waterproof Bible resembles a regular Bible, but on a second glance its durability shines through. 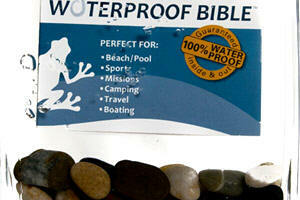 “This is why our soldiers and chaplains have long used the Waterproof Bible. It can go to the frontlines and back without being destroyed by the wear and tear that causes a regular paper Bible to fall apart,” said Bobby Bardin, who co-owns Bardin and Marsee. What began as a project to make a durable Bible for a few friends has turned into a growing niche within the Bible segment of Christian publishing. With Waterproof Bibles now available in nine foreign languages and five English translations, NIV, ESV, NKJV, KJV, and NLT, the news release said Bardin and Marsee Publishing has seen significant growth since its inception in 2005.